Ha ha fooled youI'm a submarine! 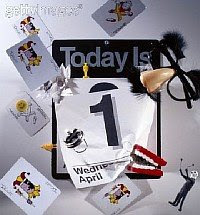 Today is 1st April, the “all fool’s day”. The legend is that King Charles IX changed April 1st to January 1st as the first day of the year. And the people who stayed with the 1st April as the first day were considered as “April fools”. 1. Gmail’ launch on April 1st 2004 was widely believed as a prank. In fact on the same day, in 2007 a python escaped from its New York city’ office was considered as the hoax created by the Google. It probably doesn't make sense following certain occassions anymore..Fools' day being one...I guess far too many people actually go overboard with the deception thing and yes at times its had disastrous results..
nice blog you ve got Ekta! Hi waiting to read your 50th blog!!! It would surely be an amazing acheivement. Thanks Rahul, Ashutosh, CN, sachin and Mayank for all your kind comments. Keep posted.